If your foundation repair job requires removal or damage of existing concrete including patios, driveways, or sidewalks, our team will repair and/or replace the concrete. Before (left) and after pictures of cracked and unlevel stairs in front of a residential home. Cracked and settled concrete sidewalk and stairs before (left) and after repair. Unsafe concrete stairs in front of a residential home (left) and repaired on the right. 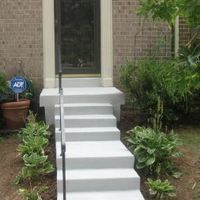 Settled concrete front steps (left) in front of a home. Before and after picture. The process of leveling the concrete stairs for a residential client.